Hormel Foods Corporation and Vons donated more than 5,000 jars of SKIPPY® peanut butter Wednesday to the Jacobs & Cushman San Diego Food Bank to support its mission to provide nutritious food to individuals and families in need in communities throughout San Diego County. The donation was part of the hunger program created by the makers of SKIPPY® peanut butter in 2018. The program involves a partnership between Hormel Foods and grocery retailers across the country and is part of the company’s philanthropic efforts that focus on hunger and education. 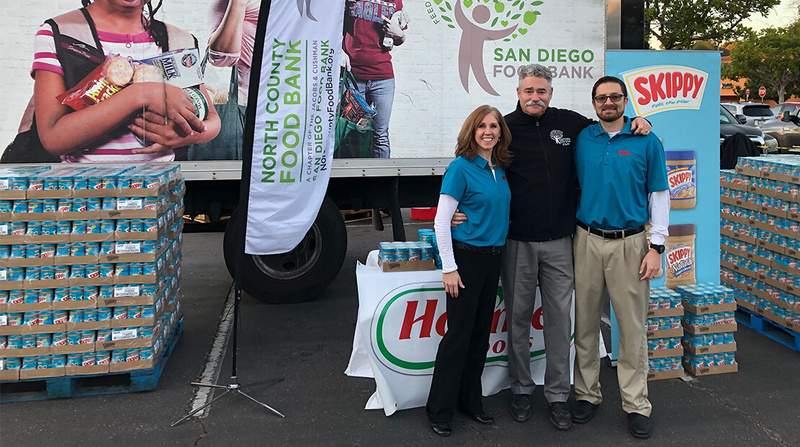 The peanut butter – enough to make more than 80,000 peanut butter sandwiches* – was donated at the Jacobs & Cushman San Diego Food Bank Holiday Food Drive at Von’s Murphy Canyon location.